berries have thick skin and a mealy taste. berries can be dried for storage. dried berries can be ground and cooked into a porridge. dried berries can be popped when fried in grease over low flame. the variety in Nunavut is Common bearberry (Arctostaphylos uva-ursi). grows in dry open woods and gravelly or sandy soils in arctic and alpine regions. warning: may cause nausea or constipation if eaten in quantity. warning: prolonged use may case stomach and liver problems and should be avoided by children and pregnant or breast-feeding women. 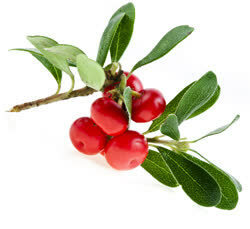 Last century, the Arctic bearberry species were considered to be in the genus Arctostaphylos. Most of the species in that genus occur on the central coast of California. The Arctic species are different because the leaves have finely toothed margins, and the edible fruit contain five seeds. Fruit of Arctostaphylos are not good for eating, and contain ten drupelets. These differences led botanists to decide the Arctic plants should be in a different genus. Photo: #01 Alpine Bearberry - Last years bearberries, flowering.